California company car #062 is the only convertible (VIN #0139). The blue fastback is inventory number #064 or #074. These cars played a role as the "68 photographic cars," from April 1967-July 1967. This document refers to the '68 proto Fastback' as an Automatic, however, the car at the July 7, 1967 LLTC (Riverside Int'l Raceway) was clearly a 4-speed. Also interesting to note is the author's use of the word "disposal." 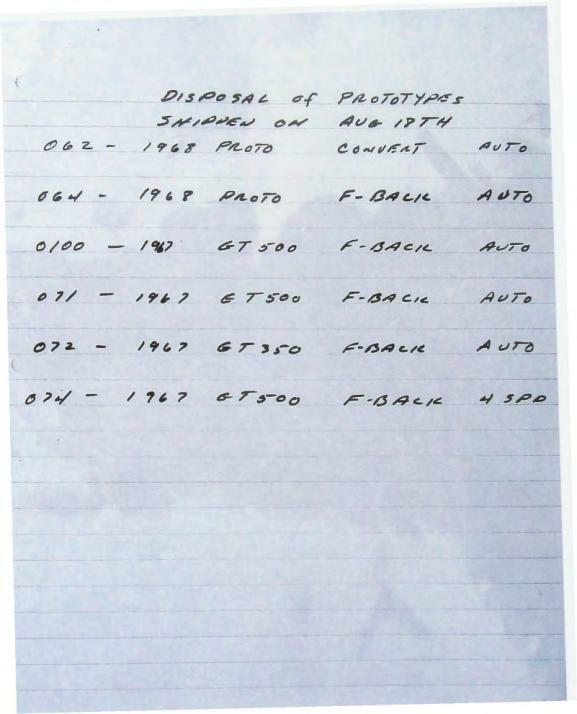 We know more than at least three cars on this document are still around today, so the term "disposal" apparently meant that, as the Shelby Program was spun-down, these cars would be shipped to FoMoCo in Dearborn. Ford eventually sold these vehicles as used cars (either through dealers or on their corporate B-lot). Car #071, originally was listed on this page to be disposed of, however, it was a late substitution for car #065 on the Ionia Move - Vehicles Remaining in California page to be sent to the U.S. Govt. after California Emissions testing. Apparently it was not crossed off this page, but it is our belief it was not shipped to Ford in Dearborn along with the other vehicles listed on this page. Note: inventory numbers are not the same as serial numbers (VIN). The consolidated Company Cars table page attempts to cross-reference the company car numbers to VINs.